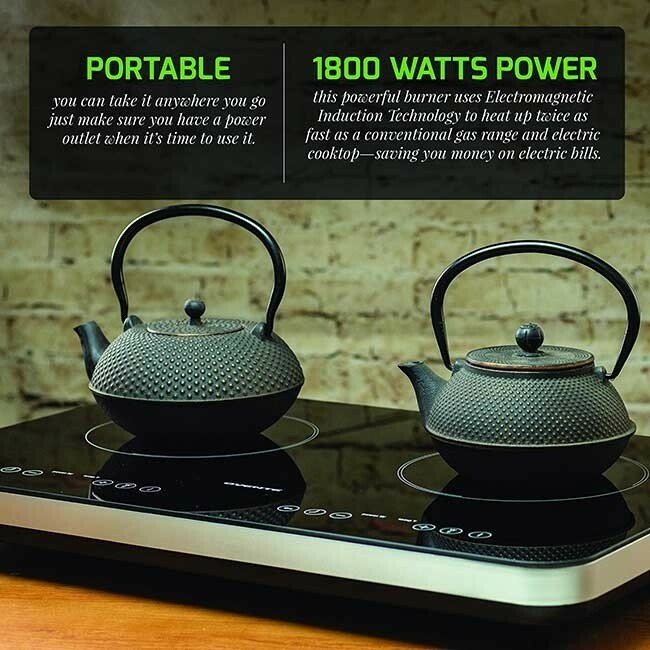 QUICK, POWERFUL & ENERGY-EFFICIENT – Powered by 1800-Watts, this powerful burner uses Electromagnetic Induction Technology to heat up twice as fast as a conventional gas range and electric cooktop—saving you money on electric bills. 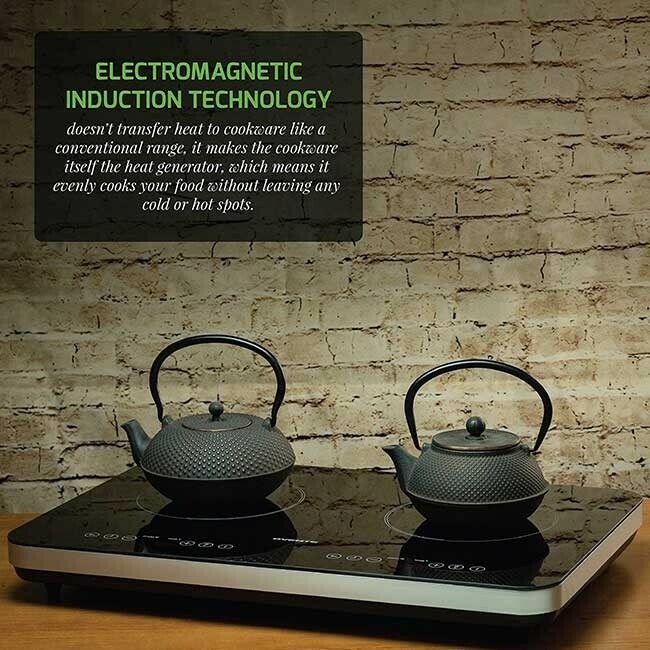 EFFECTIVE – Electromagnetic Induction Technology doesn’t transfer heat to cookware like a conventional range, it makes the cookware itself the heat generator, which means it evenly cooks your food without leaving any cold or hot spots. ADJUSTABLE –8 Variable Temperature Levels (ranges from 140-465° F) allows you to immediately change the heat levels to serve your needs. 5 Programmed Timer Levels (MIN 1 min, MAX 3 hours) helps you stay on track in case you need to multitask. 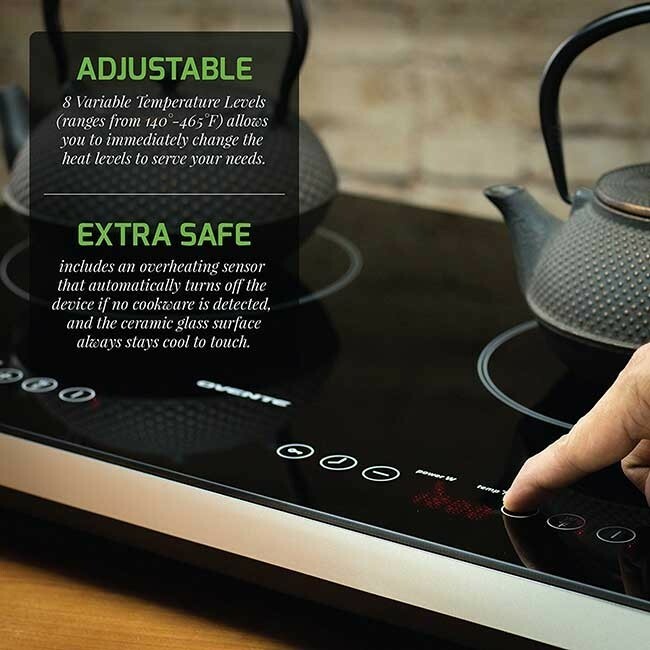 EXTRA SAFE – Includes an overheating sensor that automatically turns off the device if no cookware is detected, and the ceramic glass surface always stays cool to the touch. It also features child safety lock and a hot caution light for extra safety. 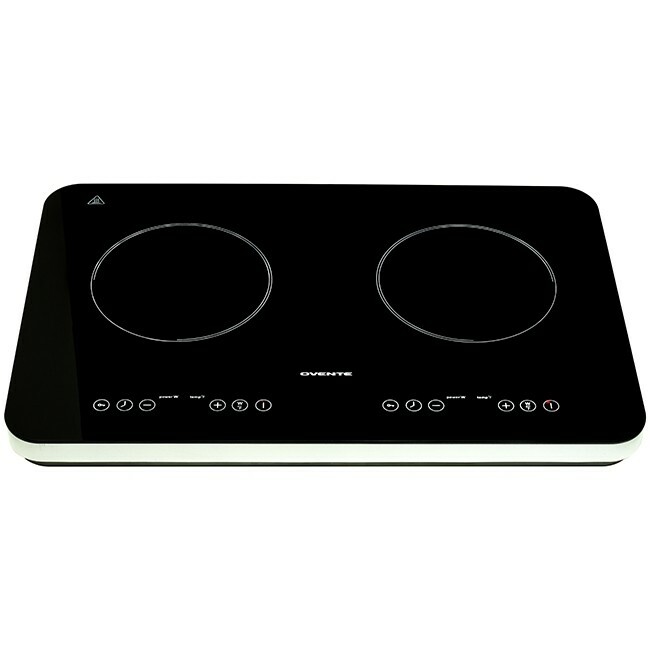 MODERN, SLEEK & EASY TO CLEAN – This burner’s sleek black glass body looks so good that you can leave it on a countertop as a stylish centerpiece. Its ceramic glass surface is also stainproof—simply wipe clean and it will look as good as new. Discover what the buzz of Induction Cookware is all about! 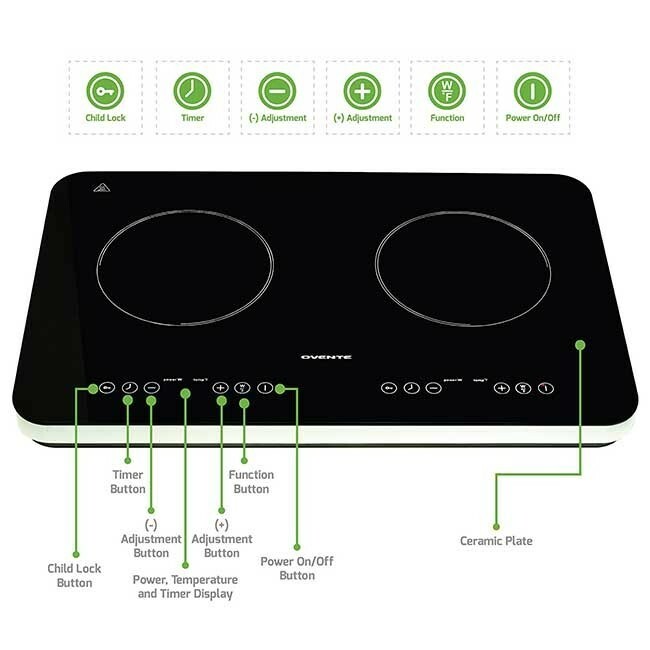 With the Ovente Induction Cooktop, you no longer have to worry about uneven heat. It was carefully designed to evenly cook a variety of different foods without any cold or hot spots, while also losing less heat in the process. 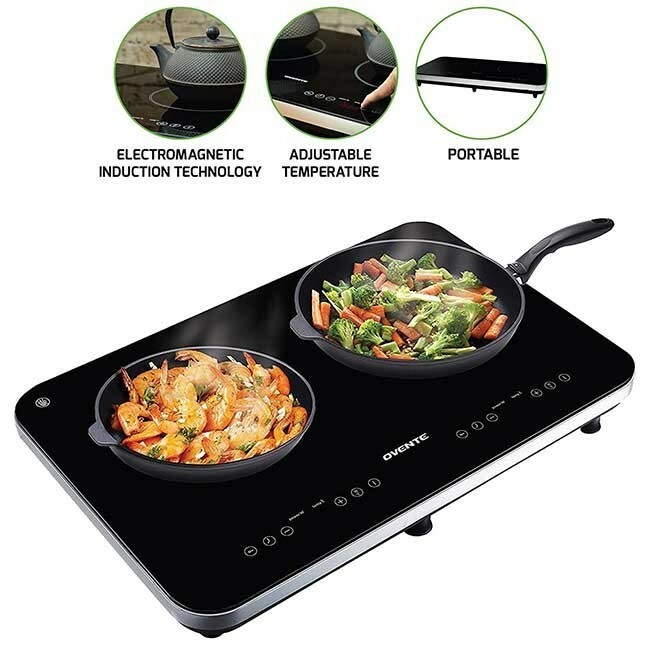 All you have to do is use it with suitable induction cookware such as cast iron, enameled steel or iron, and magnetic stainless steel cookware. 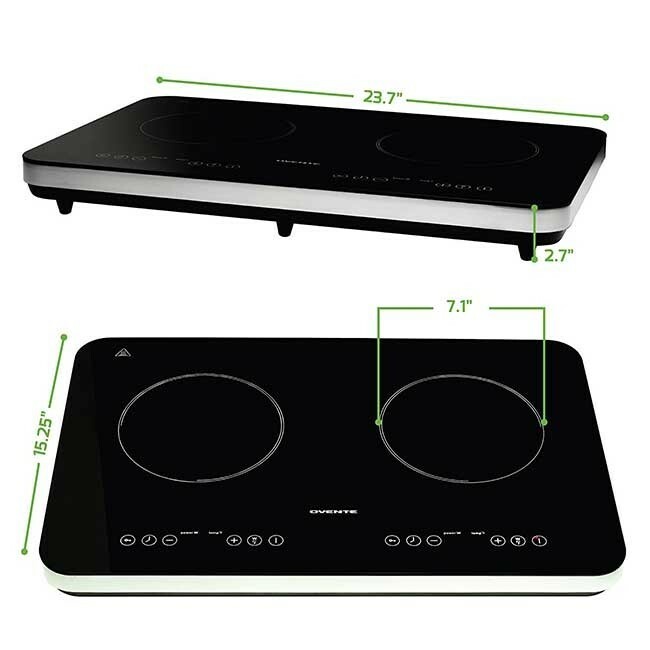 To check if it will be compatible with this burner, make sure it has a flat bottom, then take a magnet and place it near the bottom of the pot or pan. If it sticks to the pot or pan, it is induction-capable. This burner is also protected under Ovente’s 1-YEAR LIMITED WARRANTY, so snag yours today, absolutely RISK-FREE! From quick stir-frys to creamy mushroom risottos, this burner can do it all at a fraction of the time! It boils water in a snap and shaves several minutes off of your normal cooking time because it heats up so rapidly. This is perfect kitchen tool for folks who are constantly pressed on time, or those who simply want more time to enjoy other activities. It also doesn’t need to be used just in the kitchen, it’s portable so you can take it anywhere you go—just make sure you have a power outlet when it’s time to use it. It’s also a low-noise burner, so you can cook at any time of the day without worrying about waking anyone up. It’s also much safer than your typical range—it has no open flames or gas emissions as well as several different safety features because your safety is a big priority to us.